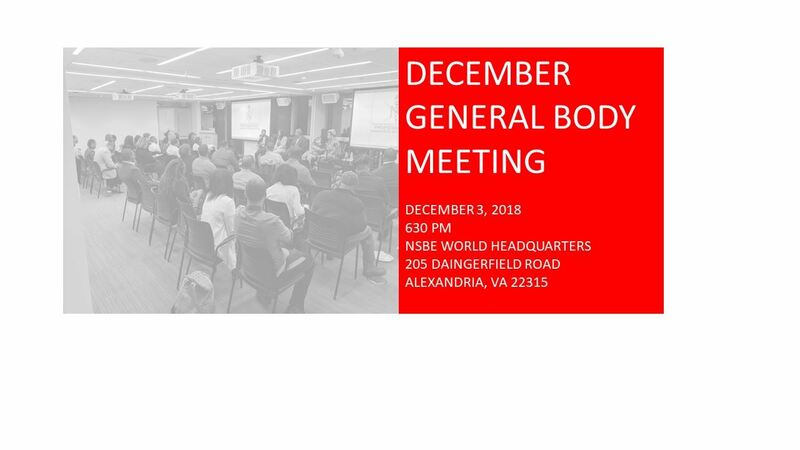 Join NSBE DC for our December GBM as we will be at NSBE WHQ. We will be talking about the 30 for 30 Campaign to raise $30,000 for scholarships and will be discussing the results of the Membership Survey and action items moving forward. There will be committee updates and we'll have our second Speaker Series Discussion! Afterwards we will walk over to Laporta's for post-meeting relaxation! The NSBE DC GBM is free for everyone to attend. Dinner will be provided. The nearest Metro station is King Street on the Blue and Yellow Lines. Street Parking is available as well. Email president@nsbedc.org if you have questions or need more information.